A well worn cookbook is a map of taste. Flip through the pages and you’ll find the spine naturally giving way at favourite dishes, the recipes marked with notes or greasy fingers. It reveals the cooking history of it’s owner and holds memories in those oil splattered pages of shared meals and good times. One of my most worn cookbooks is Falling Cloudberries by Tessa Kiros . It is a rich and colourful memoir that traverses the globe from Finland to South Africa via the Mediterranean to capture Kiros’ family recipes. If you let the pages of my copy fall open, they will land at Greece, and you’ll find the recipe for a chickpea salad. This is a most satisfying salad. 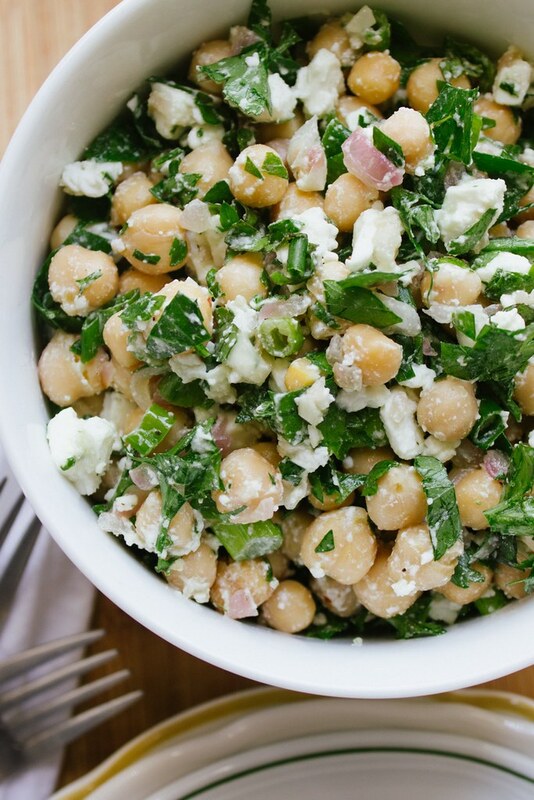 The chickpeas make it almost a meal in itself and the feta coats everything to make a salty, creamy dressing that comes to life with the citrus and herbs. It’s my go-to dish for whenever I’m asked to bring a salad to a party, especially BBQs as it goes so beautifully with grilled meat. The flavours in the salad get better over time, so make it a few hours before you serve it if you can. I top leftovers with smoked salmon or stir through some tinned tuna to make a delicious work lunch. If you like coriander (cilantro) more than I, then add 1/2 a cup like the original recipe calls for. I love this recipe… I’m sure we’ll be trying it out soon! Funny, I made something very similar for lunch today. Chick-peas from the pantry, and parsley from the garden. However, I’m so going to pick up some feta on my way home tonight cause yours looks just that much more yummy! A general rule in my kitchen: feta makes *everything* better. Looks lovely and summery. I love what you had to say about cookbooks. Some of my favorites have been picked up at garage sales over the years, with cooking notes in the margin – “try this one” ; “needs more baking time”; “best banana bread ever!”… Were the notes left for me? Ahhh another one of your recipes that I just have to make! That looks so lovely and fresh! I’ll definitely be making that soon – even if it is winter! A friend has that book and I’ve loved paging through it. This salad looks so fresh and lovely! I can almost taste the salty tang of feta from your photos. 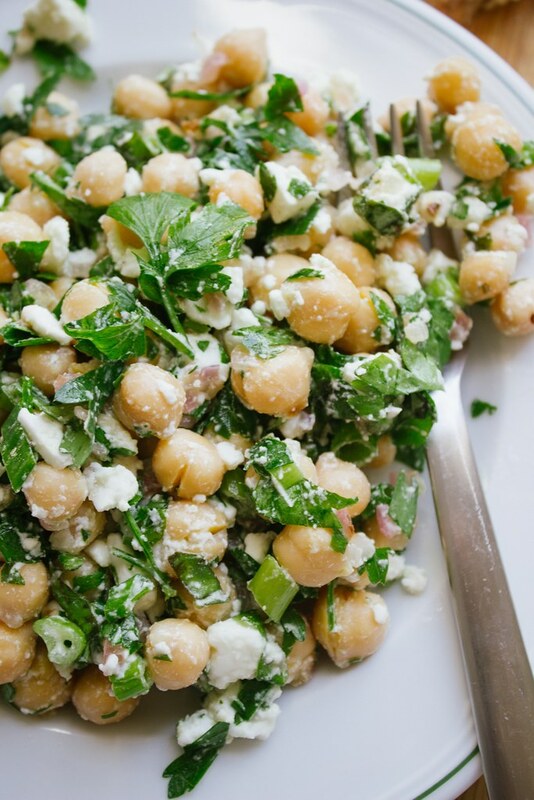 This salad is delicious instead of using parsley I used celantro. Your writing is lovely, and your photos are stunning; everything looks like the best meal ever. That is very sweet of you to say Jodie. Thank you! Thanks Emily, that’s lovely of you. I really appreciate it. Amelia, love, love, love your blog. So glad I found it. This recipe and pics look delicious. I have a favorite chickpea and hijiki recipe that your salad made me remember, to make — essentially — veggie “tuna fish” salad sandwiches. Lemme know if you’d like it =) Warmest! I have never cooked with hijiki before – I’d love to try it, so yes please to the recipe! Thanks so much for stopping by Christina. I’ll send it over to your simpleprovision’s gmail by the end of the week! Thank you, Amelia, and feel free to check out my food blog — smallkitchenchronicles.com. There are a bunch more recipes there I think you might like. Be well! Thanks, Amelia — and thanks so much also for the “follow”! Oh, yes, I hear you on the *tiny* kitchen, lol. The clean, open counter tops idea really made all the difference in mine. Be well and talk again soon! I’ve just made this simple salad and just had a bowl of it for lunch. Delishhh, very refreshing, love the pinch of red chili flakes tospice up the peas. I replaced the scallions with fine chopped radishes from the garden. Thank you Amelia! Radishes! Delicious! So glad you enjoyed it Christine. This looks absolutely amazing! 🙂 Thanks for the tips. I love this salad and it brings back such lovely memories. I made it for 100 people at Janet’s wedding in DC. It was the most sought after recipe afterwards. Thanks so much for the sudden memory trip to summery DC, it’s cold here! You’re welcome Katie! Knowing your cooking, I bet this wasn’t the only dish that people requested the recipe for. I’m planning to make a Middle Eastern baked whole fish on the weekend. Now I’m going to be making this to go with it. This is going on my list of “must try”, I adore simple delicious cooking especially when I already have the ingredients available! Made last night to go with steak – would have to say is a favourite of mine and so quick and easy to make not to mention healthy!!! I’m so pleased you liked it Barbara. This sounds absolutely delicious! Saving this one for when it gets a little warmer, can’t wait to try it! so easy, so yummy! I add chopped fresh spinich for even more healthy stuff. Thanks for a great salad! it was quick, easy, and delicious! thanks! I made this salad and it was terrific, my husband loved it I only made half the recipe and today I made it again. Love,love ,loved it! I’m so glad you enjoyed it Cynthia. Baked salmon sounds like it will be delicious with it! So happy you and your daughter like it. Just made this – it is amazing!!! I love this salad! It’s simple, and tastes amazing. I’ve already made it 3 times, and am going to make it again tonight. The only thing I’ve noticed is that I have to use a little more olive oil than the recipe calls for. Just made this.. and it was simple and delicious. Thanks for sharing! So easy and yet so yummy! Just wondering about the three garlic cloves. Do you leave them whole or do you mince them? Hi Diana, yes, mince the garlic. I made this today. Just by looking at the ingredients I knew I would love it and I did. Delicious. This is delicious! I only had a yellow onion, not a red one, and it is still really good! I definitely want to try with the red onion next time. What a great recipe! I’m glad you liked it Elisabé! I meant 2 x 400g tins of chickpeas, I’ve added a “x” to make it super clear, thanks for pointing it out. Pingback: New Year, New Adventures | This is an adventure. I had pinned this recipe quite a while ago and finally made it yesterday as part of my meal prep for work lunches for the week. I followed the recipe exactly as written except for the scallions. It’s so delicious! I portioned out my lunch and tossed in a tin of white albacore tuna in water. It’s a great, filling lunch! The sauteed onions and garlic (rather than raw) totally make this dish! I’ll be making this for my next pot luck! Will this keep if made ahead of time, Amelia? This is a great Sid dish with a little arugula added in… Enjoy! Had fresh parsley in the garden so had to make this. Only issue was ingredients list just said onion. Wasn’t until I got to ingredients that it says red onion. Lucky I had a red onion. Now what to do with chopped yellow onion? However, this is a yummy salad. Woops! Thanks Yvonne, I’ve updated the ingredients list to specify red onion. Chopped onion freezes well in a freezer bag for next time you need it.